By Xah Lee. Date: 2012-05-06 . Last updated: 2014-08-04 . Here's a few interesting things. This is called protocol-relative URL Format. It prevents messages like «This Page Contains Both Secure and Non-Secure Items». The problem with this is that, if your HTML is designed also for local browsing (such as HTML based book), such link won't work. By some quick web research, it appears that it's been said and tested from HTML5 folks that this shortened version always works, even in very old browsers. That's why HTML5 folks made it into HTML5 spec. Note: it's a good practice to always include a charset declaration, and it should be utf-8. This is really the worse recommendation, and a lousy part of HTML5 spec, because it makes the language much more confusing and complex. 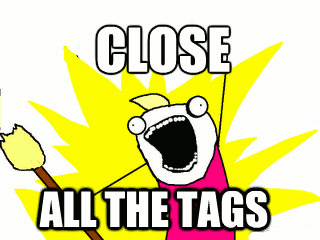 It would be much better to NEVER omit tags, so the syntax is simple and regular. Once you encourage omitting tags, soon people will omit tags that shouldn't be omitted, introducing confusion and complexity. If you read the HTML5 “living standard” document, you can see how complex and confusing it is. A body element's start tag may be omitted if the element is empty, or if the first thing inside the body element is not a space character or a comment, except if the first thing inside the body element is a script or style element. A body element's end tag may be omitted if the body element is not immediately followed by a comment. Good Style or Bad Taste? • They suggest indenting by 2 spaces. This is really getting into trivial opinion. Also, indenting is really not necessary. If you indent the whole HTML document, it increases file size significantly. By recommending number of spaces to indent, it opens a can of worms: should one do indentation for the whole HTML file or just part of it? If just parts, when is it appropriate? And the classic: Why spaces and not tabs? • They suggest all lowercase for HTML (for tag names, attribute name/values, etc.). This'd be great advice for XML, since it is case-sensitive, and XHTML element names are all lowercase. But elsewhere they often suggest readability. Note that CAP CASE for tags were the recommended style for HTML from about 1995 to 2005. It's more readable, because it distinguishes markup data from content data. Sure, i myself prefer lowercase, because it's easier to type and compatible with XML/XHTML (when you move code), and readability isn't a problem because of syntax highlighting in editors. Still, this point illustrates the erratic change of tech philosophy over the past decade. • They recommend using HTML5, and recommend against using XHTML. Note that XML/XHTML was widely considered the future from about ~2000 to ~2005. The HTML5 people are rebels and want to overthrow strict validation and XML. Curiously, google's style guide itself is in XML! • They recommend not to use redundant 0. For example, font-size: .8em;. This is a bit strange. This is less readable and saves one byte, yet they DO recommend a space after the colon, and recommend to always use a semicolon even when not necessary. This will save you a few bytes, and a few microseconds. However, it's a major reduction of precision and correctness. What if some iframe widgets you use on your site also uses the same class name? Meanwhile, elsewhere Google recommend adding a prefix as namespace to decrease name clashing. So, the 2 advice conflict. All the above points are rather trivial. After all, its merely about “style”. However, some stylistic issues are critical. On critical issues such as correctness and well-formedness, Google seems to side with irregularity and bad taste.